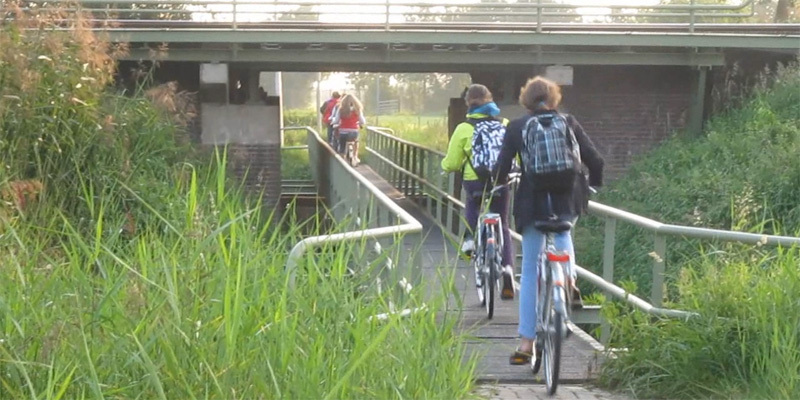 Hundreds of thousands of children cycle to school every morning in the Netherlands. The roads and streets are literally full of cycling children for about one hour. The "cycle highway" from Geldermalsen to Culemborg is one such road. Hundreds of children going to school take the same safe route here. They form spontaneous groups and the closer they get to school the larger the groups become. When the school bell rings and all the children are in class, the cycle highway looks as deserted as it was before the kids went to school. Some things in the video may need a bit of explaining. 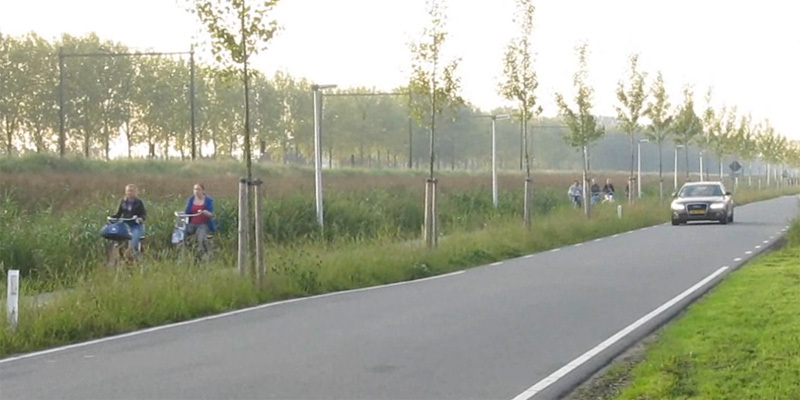 The route you see is not an official 'cycle highway' it is just one of the many good cycle paths in the Netherlands. It was built between two smaller towns and it has featured in an earlier video. The road it was built next to, is a minor rural road so there is not much traffic and the speed limit is 60km per hour (37mph). Still the authorities did decide to build a separate protected cycle path next to such a minor road. So where Dutch authorities think cycle paths are needed does not only have to do with the speed and the amount of motorised traffic but also with the number of cyclists. Not much motorised traffic and a speed limit of 60kph (37mph) but with a separate protected cycle path. The children all take a bridge and an underpassing to cross the railway line that seem a bit in contrast with the cycle route. The bridge is old, narrow and there is a low clearance under the railway line. This is not part of the main cycle route. That main cycle route continues straight on to the town's center. But the kids need to be in schools at the edge of the town in a new part of that town and the old underpassing takes them there quickest. I can only imagine there was no money (yet) to build a new underpassing where it was needed most. The Netherlands' Railways do not allow any new level crossings in the Netherlands but building an underpassing is of course expensive especially in this case where water has to be crossed as well. Since it is obvious there is a demand it cannot be ruled out that one will be built in future. At least the kids can take the old bridge and underpassing and they don't have to make the detour that motorised traffic has to make. Even though the bridge is very narrow it is fit to be cycled on, there is no annoying 'cyclists dismount' sign. Narrow old bridge under a railway line. Not up to the latest standards but at least usable. The number of children you see in this video is not exceptional. Such large groups of cycling children can be seen all over the Netherlands in the morning rush hour. Perhaps useful to know that the Netherlands does not have a school bus system. Some children go to school by public transport but school buses do not exist. There are several other posts about school travel on this blog. You're videos seem to only get more stylistic, informative and awesome, very impressive! I found it impossible not to smile while watching this video– the children are so cute, and liberated, cycling to school. The numbers too, goodness that's a lot of kids cycling! I get giddy when I see a parent and child, or 3 teenages cycling together here so imagine my delight when seeing all these kids. I wish I could have been a Dutch child cycling to school 10 years ago... at least I got to walk and take bus. I love this kind of entry! The videos of cycling infrastructure and how it is used are great, and I have been linking to your blog as I think using Dutch examples might just help break people out of the tunnel vision they experience when talking about transport here. Thanks so much for yet another great talking point. In one Sydney school they have even banned kids from riding kick scooters to school. It's more than a bit embarrassing. For those of us living in Australia, this video is just depressing. We're still having helmet debates for goodness sake! What a joy to see - children set free ! Yeah, I agree - what a joy to see - so many kids on bikes riding in a relaxed way. What a blessing you don't have school buses. They may make sense in Canada and in the U.S., where the distances can be large and there is no safe pedestrian/cycling infrastructure (outside of the cities - in the cities there are sidewalks, of course). Your kids must be much more fit and healthier than NA kids. Michael: What is a long distance in this context ? There is some scope to be truly remote in Canada and the US, but surely most children only travel about the same distance as they do in the Netherlands. In Mark's video, he focuses on a 10 km distance. Previously I've shown distances travelled by many secondary school children in this area of 8.5 km and 17 km. Most who live in a city will have under 5 km each way to go to get to school. Our two teenagers get off quite lightly as we live just 1 km and 3 km from their respective schools. Few travel more than 20 km (i.e. a 40 km or 25 mile daily round trip) to get to school as usually a suitable school can be found in a shorter distance than this. I know of one teenage boy locally who does about 50 km each day to get to school and back, but for him this is training as he's also quite an active racer. I used to cycle 20 km to get to school (in Drenthe, Borger - Emmen) and back. Thanks Lodro. It's further than average, but as you know, it's not that unusual around here. However, this would be astonishing in most countries. A couple of years ago I covered a story from the UK about a fourteen year old child who because he lived 11 km from school couldn't get there at all. Riding a bike was never seen as an option over such a distance. The bicycle parking section of this video reminds me of my high school back in India. We didn't have any cycle paths. We simply rode on the streets, in horrendous conditions. But, we enjoyed it! Thanks for bringing this nice video to all of us. When we lived in Delden, (Overijssel) my wife had to be out the door before seven if she wanted to get onto our street (Greekerinkskamp) due to the volume of kids on bikes. They were all high school kids riding to Hengelo. Just one of those minor things to at first find amazing and then to get used to. Very difficult to explain to someone from North America. Your videos certainly help. In Australia we are worrying about childhood obesity which leads to adult obesity and enormous expense for the health system 50 years out. It amazes me that our governments cannot see this easy solution. Amazing! I sat with my 9 year old son watching this. He was in complete awe. He also mentioned how peaceful it was; so many kids yet so peaceful - not words one would usually put together in the same sentence :-D Magical. Really enjoy watching your vids and can't wait for more.